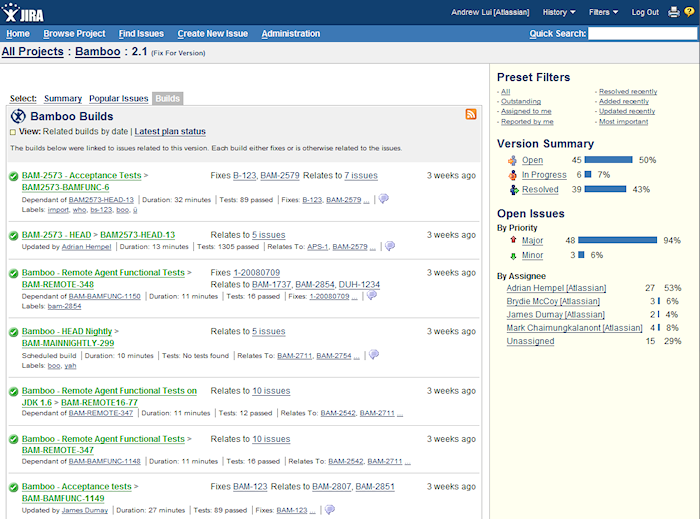 The Atlassian Bamboo team is proud to release Bamboo 2.1. Bamboo 2.1 introduces a suite of new features which help you monitor the status of your JIRA issues and Bamboo builds side by side, when you integrate Bamboo with Atlassian's JIRA. This includes enhancements to issue viewing and linking functionality in Bamboo, enhanced views in both JIRA and Bamboo, and an easier setup process to integrate JIRA and Bamboo. Upgrading to Bamboo 2.1 is free for all customers with active Bamboo software maintenance. The Bamboo plugin for JIRA is free for all customers. You can download Bamboo from the Atlassian website. To obtain the full benefits of this release, you will also need to install the latest JIRA Bamboo plugin, which is available for free. If upgrading from a previous version, please read the Bamboo 2.1 Upgrade Guide. 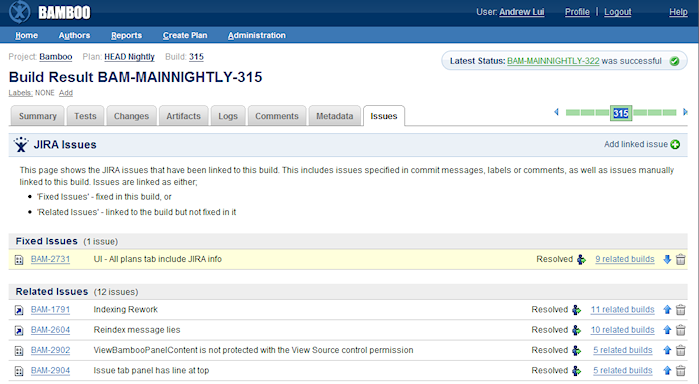 Bamboo now provides you with more ways to link JIRA issues to your builds, when you integrate JIRA with Bamboo. Bamboo will still automatically link an issue to your build when you specify it in your commit message, but it will now also pick up related JIRA issue keys that have been included in build comments and labels. If you want to manually link a particular JIRA issue to a build, we have included a new user interface to let you do that too. Read more about linking issues to builds. We have also enhanced the issue to build linking to allow you to specify which issues are fixed by a build. This handy function will make it more convenient for your developers to flag when a particular JIRA issue is fixed in a project version. The build artifacts are then automatically made available as links from your JIRA issue, allowing you to download them straightaway in JIRA. Read more about editing issue links for a build. Real-time tracking of the builds for a project or version has been included in this release of Bamboo. 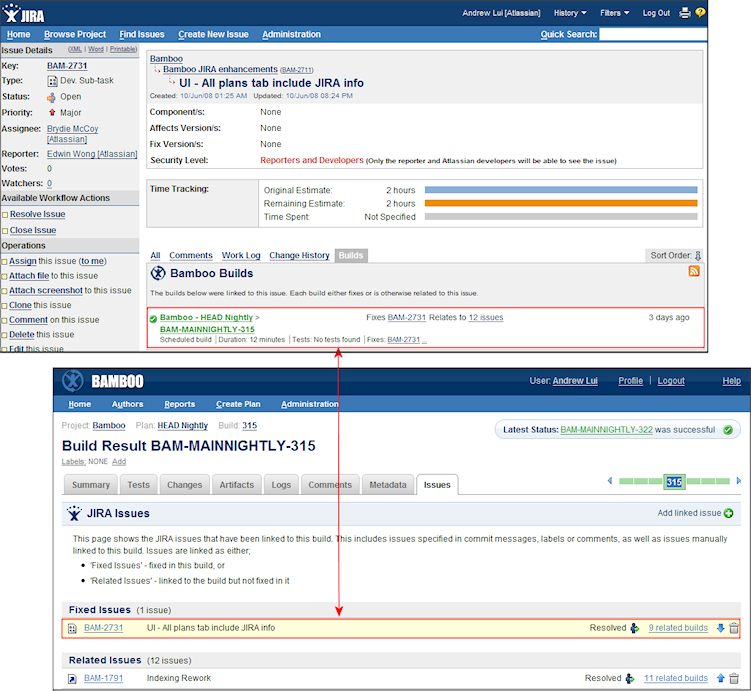 View the status of the builds for a project or a version at a glance in JIRA and drill down for details of each issue and build. Read more about viewing builds for your project and viewing builds for your project version. Bamboo 2.1 now also provides you with a detailed view of the issues related to builds in Bamboo. Find out which issues are linked to completed builds, to track which issues were worked on recently. As part of the Bamboo 2.1 release, we have extended our plugin framework by introducing the post change detection plugin point. This allows you to customize Bamboo actions before an build is queued, giving you greater flexibility to manage your build process.